The value of permits issued for commercial buildings in B.C. has never been higher. New commercial permits topped $564 million in November, a 130 per cent increase over October, according to Statistics Canada. The agency reported that a $240-million permit for a new office tower in the Greater Vancouver region contributed most to the gain. Total non-residential permits – which include commercial, institutional and industrial developments – reached nearly $742 million, a 75 per cent increase over the month before. B.C. accounted for most of the national increase in non-residential building permit values, which rose 11.6 per cent in November to $3.3 billion. Not all B.C. values rose. Month to month, the value of permits for residential buildings fell 27 per cent to $893 million. The decline was driven primarily by a drop in permit values for single family dwellings, which fell 30 per cent. At the regional level, Victoria and Vancouver saw the third and fourth largest year-over-year gains for total permit values. In Victoria, November values rose 72.6 per cent over 2017. In Vancouver, they were up 63.4 per cent. Both regions were behind only Quebec, where values rose 177.3 per cent, and Brantford, where values increased by 158.2 per cent. In total, Canadian municipalities issued $8.3 billion in building permits in November, up 2.6 per cent from October and 6.6 per cent over 2017. According to the REMAX 2019 Housing Market Outlook, the country’s average sale prices will get a 1.7% boost, an indication that the balance has finally returned to Canada. The report notes that markets throughout the country stabilized this year after the 2017 aberration that saw prices in markets like Toronto’s surge beyond reasonable levels. Stabilization is expected to continue through 2019, a likely consequence of interest rate hikes that are believed will increase as the year goes on. Thirty-one percent of REMAX survey respondents don’t believe interest rates have hitherto affected their ability to afford a mortgage, but that optimism doesn’t extend beyond December. Another REMAX survey of its brokers and agents revealed 83% expect interest rates to make Canadians’ home purchases cumbersome next year. The report also expects sale prices in Vancouver to decline 3% in 2019 because obtaining a mortgage in the Metro region is becoming well-nigh impossible. "The drop in sales in key markets across British Columbia can be partially attributed to Canadians' increasing difficulty in getting an affordable mortgage in the region," says Elton Ash, REMAX of Western Canada’s regional executive vice president. "The situation created by the introduction of the mortgage stress test this year, as well as continually increasing interest rates, means more Canadians will be priced out of the market." The Greater Toronto Area, on the other hand, is expected to fare better next year as REMAX predicts sale prices will rise 2%, thanks to high demand for homes priced below $1 million. Demand will be weaker for homes above $1.5m, though. According to Christopher Alexander, REMAX’s vice president and regional director for Ontario-Atlantic Region, looming rate hikes might be spurring the restraint. Alexander added that Toronto remains a popular destination, which should balance out weaknesses in its market. After exhibiting relatively modest performance for most of 2018 with the advent of stricter mortgage qualification rules, Toronto is seeing a resurgence in market competition once again. The latest numbers from the city’s real estate professionals’ association indicated that the total number of active for-sale listings in the GTA saw a 9.8% year-over-year decrease in November, down to 16,420 units. During the same time frame, the volume of new for-sale listings in the region shrank by 26.1%. “New listings were actually down more than sales on a year-over-year basis in November,” TREB President Garry Bhaura said, as quoted by Bloomberg. “This suggests that, in many neighbourhoods, competition between buyers may have increased. Relatively tight market conditions over the past few months have provided the foundation for renewed price growth,” Bhaura added. Average home sales price last month was $788,345, growing by 3.5% from the same time last year. Meanwhile, total sales in November stood at at 6,251 completed deals, representing a 14.5% annual decline. TREB stressed, however, that any year-over-year comparison should take into account that November 2017’s performance is “distorted” due to a large number of buyers rushing to beat the implementation of B-20 in January 2018. New light industrial/office strata projects springing up from Mount Pleasant to East Vancouver may have tapped into a profitable path, despite per-square-foot prices ranging from $800 to $1,000. The most recent manifestations include a four-storey project on Yukon Street at West 6th Avenue – formerly the 3 Vets outdoor store – by Chard Development, which bought the site last year for $20.4 million. Now under development, the 49,000-square-foot Yukon project will feature a high-ceiling ground floor for light industrial, with bay access for trucks, capped by three floors of stylish office space. Chard recognized a demand for smaller office sizes from the area’s tech, finance and retail services industries. As a result, Yukon will feature smaller unit sizes (1,000 to 5,000 square feet) to adapt to this new Vancouver real estate reality, according to Byron Chard, Chard’s principal and CFO. A similar Chard project at 34 West 7th Avenue sold out all 48,000 square feet while still under construction. Nothing has pre-sold yet at the Yukon, where strata space starts at $1,000 per square foot. The building will include a freight elevator, bike lockers, showers and 83 parking stalls, and it could prove popular, according to the type of high-tech tenant Chard is targeting. Completion is expected in 2020. “I can definitely see the demand,” said Dogu Taskiran, a partner and founder at Stambol Studios, a virtual-reality startup that concentrates on the real estate market. Taskiran said the Mount Pleasant location and ample parking would be among the draws. Chard noted that a startup could buy office or industrial space at Yukon and lease out part of it until it expands, but he expects most of the buyers will be sole owner-occupiers. “Our goal is to make the space as flexible as possible,” he said. Alliance Partners is trying the same concept in East Vancouver with a five-storey, 55,000-square-foot light industrial/office strata project on Clark Drive at Adanac Street. Kevin Kassautzki, vice-president at Avison Young, which is handling sales of the project, expects per-square-foot prices to be in the $700 range for industrial space and $800 for offices. “I think this area is on its way to becoming the next Mount Pleasant,” Kassautzki said. There is an appetite for buying strata office space from larger players in the tech community, Taskiran said, but he added that Stambol and other startups often prefer to lease. A common theme, he said, is to stay out of the downtown, where higher lease rates and a lack of parking are considered obstacles. The annual pace of Canadian housing starts fell to their lowest level in nearly two years in September. Canada Mortgage and Housing Corp. says the seasonally adjusted annual rate came in at 188,683 units last month, down from 198,843 in August. Thomson Reuters Eikon says economists had expected an annual rate of 210,000 for September. September marks the third straight monthly decline. The slowdown in the pace of housing starts comes amid rising interest rates from the Bank of Canada, and more restrictive mortgage rules. ``The September housing starts report fits with the relative calm and return to normality in sales, market balance and price growth that we are seeing across most of the country this year, in particular Toronto, following speculative excesses in Southern Ontario earlier last year and a moderate correction in response to policy measures earlier this year,'' wrote Sal Guatieri, a senior economist with BMO Capital Markets, in a note. CMHC says the pace of urban starts fell by 5.9 per cent to 175,653 units. The slowdown was dragged down by an 8.9 per cent drop to 122,656 units in urban multiple-unit projects such as condos, apartments and townhouses. Single-detached urban starts increased by two per cent to 52,997. Rural starts were estimated at a seasonally adjusted annual rate of 13,030 units, while the six-month moving average of the monthly seasonally adjusted annual rates was 207,768 for September, down from 213,966 in August. British Columbia led the declines with a drop of 43.3 per cent due to stiffer mortgage rules and growing lack of affordability, particularly in the Greater Vancouver area. Alberta also saw a drop of 34.8 per cent, amid a weakening in the oil-producing economies. Meanwhile, Ontario housing starts increased 21.3 per cent, led by Toronto condos and Quebec was up 15.4 per cent. The Conservative Party of Canada plans to make the mortgage stress test a hot button issue in time for next year’s election, but explaining such a convoluted issue to Canadians could pose a challenge. The party’s Deputy Shadow Minister for Finance tabled two motions this year to study the impact of the stress test, known as B-20, but they were both rejected by the Liberals. Nevertheless, MP Tom Kmiec has vowed to put the mortgage stress test on the agenda in time for the Oct. 2019 federal election. Kmiec has started a website to pressure the Liberals into studying B-20’s effects. He claims that he was initially told B-20 wouldn’t be examined in the absence of more data, however, much has since come to light about Canadians being shut out of the housing market. Kmiec is dogged, to be sure. He participated in the electoral reform committee’s filibuster. But communicating the message will doubtless be challenging for the Conservatives. Ron Butler of Butler Mortgage can attest to how difficult buying homes has become this year, but too few Canadians have born that brunt for the impact to truly be understood. However, given that mortgage renewals are subject to the same stringent B-20 qualification rules, Butler believes it is still possible to make Canadians understand how detrimental the stress test is. DB Services Victoria is so busy building rental projects in Langford that it turns away new projects every month, says the company’s director of development. The Langford-based firm is one of the developers supporting the West Shore’s building boom, where rental apartments, condominiums and single-family houses are under construction. In the first seven months of this year, 911 housing units were started in Langford, far outpacing other Greater Victoria municipalities. Saanich followed with a distant 284 housing-unit starts. So far this year, 2,185 homes have been started in the capital region, up from 1,913 for the same seven months in 2017, according to Canada Mortgage and Housing Corp.’s latest report. And every CMHC report shows strong construction in the West Shore, where the population is growing and where councils say they are committed to an efficient approval system. “We have been turning away work for about two years here. We have five years worth of work lined up on the books right now. It’s all rental stock,” said Matthew McKay, partner with his mother Margaret McKay and with Gary Lahnsteiner, in DB Services. 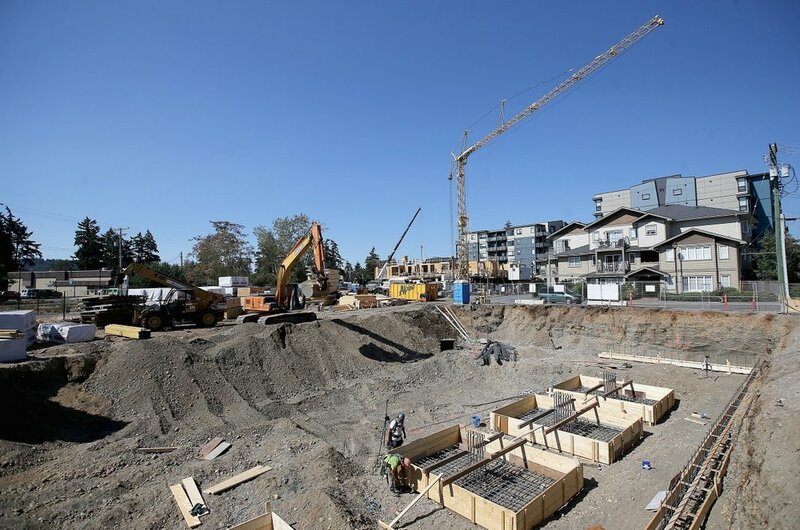 DB Services is building three rental projects in Langford. It builds and owns about one-third of its projects, with the rest constructed for clients. The Arc, at 2849 Bryn Maur Rd., is being built for a client. The six-storey, wood-frame building will have 93 units. “We just poured our first footing there today,” McKay said Thursday. The Arc is next to Hockley Corners, 765 Hockley Ave., which will have 63 units and be owned by DB Services. It is the first residential building on Vancouver Island to be built with cross-laminated timber, although some local institutional buildings have used that product, he said. It replaces a traditional floor system. “We erected today pretty much our whole floor system,” at Hockley Corners, McKay said. That work would normally take five days and require more workers. Prefabricated cross-laminated timber floor panels, supported on glue-laminated timber and parallel strand lumber columns, were used in the University of B.C.’s 18-storey Brock Commons student residence, which opened in 2016. 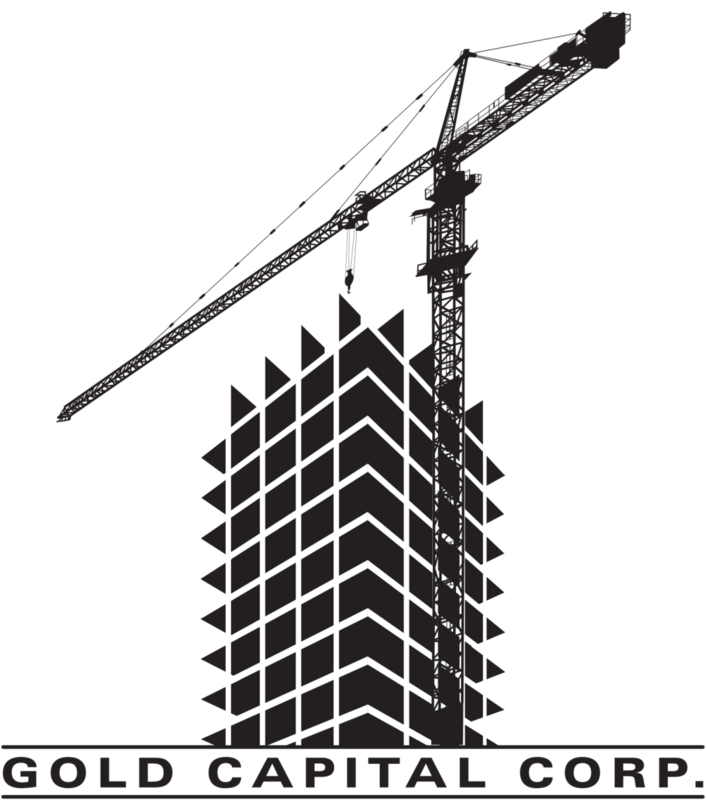 DB Services’ third under-construction project is the 11-storey, steel-and-concrete Danbrook One, which will have 90 units in the core of Langford. The company only builds rental. That type of housing is in demand in the growing West Shore and financing is easier to obtain with rental developments, because it is not conditional on presales, as with condominiums, McKay said. In June, the company finished the 63-unit Peatt Commons Phase One, at 2854 Peatt Rd. “Before we even turned it over to the client it was fully rented,” he said. Despite the year-to-date climb in housing starts, the 417 starts in July was lower than the 695 in the same month last year, CMHC said. Month-to-month housing starts numbers can vary significantly depending on timing of projects. Longer-term figures reveal a more accurate picture of the state of housing construction. The number of Greater Victoria homes under construction — some projects can take two years to complete — stood at 4,731 as of July, CMHC said. As well, the value of building permits, which signal builders’ plans, has climbed. The value of building permits in the region was $160.4 million in June, up by 29.5 per cent from June 2017 when the value was $123.8 million, Statistics Canada said in its monthly report. June of this year was up by 9.2 per cent from May, when permit values reached $146.9 million. “It is definitely the residential market that is driving some of our bigger numbers with the permit data. It’s continuing to demonstrate that it is a strong market,” said Rory Kulmala, chief executive of the Vancouver Island Construction Association. Sales volumes in nearly every commercial real estate sectors have declined in the second quarter of 2018 – though not for a lack of demand, according to a new report. The growing disconnect between supply and demand in Canadian real estate has lead to a decrease in sales velocity and an acceleration of lease rates, according to research by the Morguard Corporation. "A drop in transaction volume in the second quarter is very much a function of low product availability rather than a drop in demand," said Keith Reading, director of research at Morguard. "With quality office and industrial space at a premium, apartments are a crowd favourite as investors search for yield." Office sales have dropped nearly 50 per cent across Canada year-over-year, while industrial volume has plunged 17.8 per cent. Meanwhile, multi-family sales increased 17.5 per cent. Average sale prices for multi-family properties also increased year-over-year, from $8.5 million in the first half of 2017 to $13 million during the same period of 2018. Morguard expects investor sentiment in residential rental properties to remain strong into next term.